In 2017, we’ve seen some of the most impressive web design trends since the birth of the internet; from non-traditional navigation to heroic imagery. True enough, trends are known to change in all creative fields, with web design being no different. In relation to this forever growing field, we’ve put together what we believe are the ten most important trends to monitor in web design over the next year. We predict that designing for mobiles before larger screens will be a trend in 2018. Whilst this trend won’t be new to 2018, mobile phones have now been officially named as the primary devices used for browsing the web, therefore more companies are realising how important it is to deliver effective and quality content for a smaller screen. Even though this isn’t a design trend per se, prototyping tools are certainly one of the most useful revolutions in web design this year. Therefore, we predict that it will become even more popular next year. A prototyping tool is a must-have for any web, UI and UX designer. Ultimately these tools allow designers to quickly create working low and high fidelity prototypes of sites and services to gauge their usability and aesthetics. Plus, this is all executed without writing a single line of code. Illustrations are brilliant, versatile mediums which create friendly visuals to add an element of fun to a site. With a unique style of illustration, brands are able to roll it out through their entire identity. This can then be used in large header images, custom iconography and animated visuals. There are trends which are unique to illustration itself, although we highly anticipate that companies will be using them even more over the next coming months as a way of bringing their branding to life. This may be one of the biggest trends on this list; photography. Photography will be a keeper within web design and generally in design. Brands and designers will now be thinking more carefully with regards to the imagery they use on sites, hiring professional photographers to take their shots which frame them in the way they want to be portrayed. Unlucky for users, it will probably be a long time before cringe photography completely disappears, however expect stock imagery to be a little less popular as of next year. The saying goes, ‘a picture paints a thousand words’, but we could determine videos as doing that tenfold. Similarly to animation, a moving image automatically captures the attention of a user. Even though video is far from new, it is a versatile medium, used for marketing, storytelling, and has a more modern twist on traditional photography. It is because of this that video is quickly taking over the internet, and the above reasons are exactly why it is going to become an even greater trend in 2018. Encouraging greater levels of engagement, we are finding that many online authorities are giving more weight to video, with Facebook, Twitter and Google to name but a few. Used for getting from the top to the bottom of the page, scrolling is used to deliver great content online. Traditionally, we’ve seen designers hugely concentrating on keeping the most important content ‘above the fold’. However, we’re now seeing this old fashioned design disappear, with ‘the fold’ being a lot more difficult to define. Of course, this is due to users viewing content on screens of all different sizes, with ultimately different ways of searching for something. Whilst scrolling is a versatile mechanic, it has many applications and if executed badly, it can lead to disastrous usability. We envisage that when designers experiment even more with scrolling in 2018, it’ll be something which gets better and better, adding even more levels of interaction. We are also seeing developments in how parallax is being used online. Known for being a scrolling mechanic, a parallax gives a 3D effect as the foreground moves at a faster pace than the background. Utilised as a visual tool, a parallax gives a sense of depth and ultimately lifts elements of the screen. With content creation happening more than ever before, we predict that the cleverness of scrolling and parallax will be implemented more and more online, with designers getting heavily creative with the way that they are used. We know what you are thinking, some of these trends aren’t new for 2018! Though, in the next 12 months, we do predict a massive growth in the number of brands who build responsive-based sites. For those of you who haven’t heard of responsive design before, it’s basically an approach to building a site using CSS media queries and flexible layouts to design one single, dynamic site. It then adjusts the way it displays content according to which device it’s being viewed on. Similarly, to our mobile first trend, we predict a huge increase in the number of brands who implement this. Ultimately companies will be using responsive design to achieve the ranking they want; keeping customers happy and well-informed with their online experience. We are starting to see an increased number of UI and UX patterns emerge across the internet. With so much online competition between brands, they can’t afford to take a lot of risks according to user journey. So, if these tried-and-tested principles work, why change them? However, as these UI and UX patterns evolve, we predict that we’ll see even more brands get creative with them them. Brands are doing away with design gimmicks in order to compete, concentrating on consistent online browsing experience for their users. Who doesn’t love a bit of beautifully placed typography? It is known for being a powerful medium, able to create personality, draw emotion and set an atmosphere. As devices continue to develop, brands are expected to push the limits of typography even further, appealing to users and ultimately attracting more customers. Designers love working with bold and beautiful typography, and so users should expect to see more unique, hand-rendered typography to layer and work with parallax and scrolling designs. 2018 is definitely the year for super courageous colours online. In the past, brands have tended to stick to what we call ‘web-safe colours’, although with technological advancements we predict reproductions of super rich colours next year. The use of bolder colours in web design actively attracts the attention of users, which is a huge change from the previous established, ‘safer-bet’. Therefore, our 10th web design prediction for 2018 is, expect to see more vivid colour palettes online. Additionally, expect to see brands be a little more creative with colour according to their identity, with start-ups in articular being more vibrant in the hope of gaining more attention. 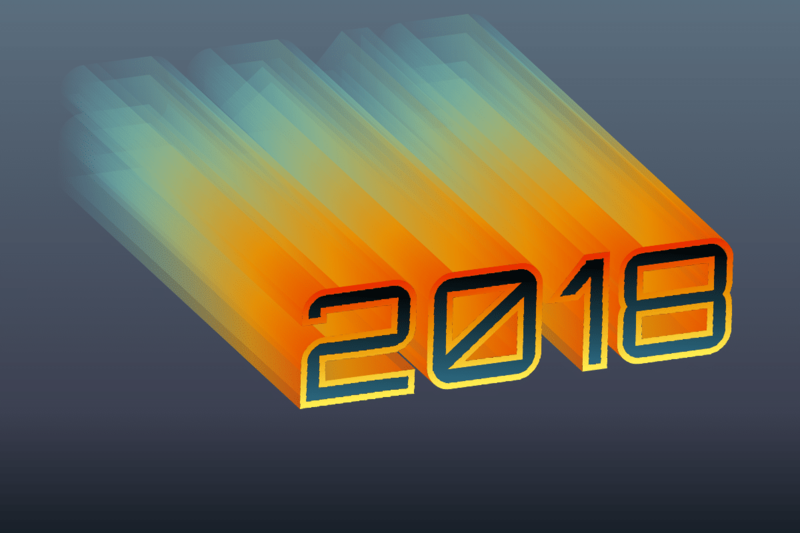 So there we have it, our top 10 web design predictions for 2018. Whilst there are hundreds of ‘trends’ going on in every creative industry, it is hard to pinpoint the most important ones. However, we really do believe that the above are some of the more core trends to shine in 2018 and beyond.